Lots of us have had trouble with the monsoon drowning our seeds and the cold too has taken a toll on the germination success. However all is not lost. 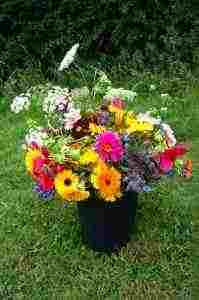 Most annuals will flower 10 – 12 weeks from sowing. So in fact your chances of success will be higher if you sow now. I will be sowing up another ten or so varieties this coming weekend…plus with all the rain we have had the soil is in great condition to take seed. Many half hardy annual seeds should NOT be sown before your last frost date…usually mid May…later in Scotland and earlier in Cornwall. If you have any questions about these or other seeds then please leave a comment below and I will get back to you when I’m back from the field tonight. Growing Zinnias For Dummies. How To Dry Cornflowers. Definitely still time, I orderd late on Tuesday, arrived on Thursday, planted on Saturday and this morning the first sign of life. Managed to get some more planted today, brilliant, thank you.